Cricket flour is not the same as cricket powder. Specifically, to make cricket flour, people generally use around 25% cricket powder to 75% baking flour. As much as it has been tried, wheat flour does not mix or work as well as standard baking flour. Yet, used as an addition to baking flour at the 25% level, it will work just like regular flour and it will have the health benefits and the protein punch without much of, if any, taste. Timid about eating insects? 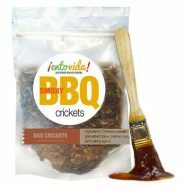 Cricket flour is the perfect avenue for you to get the full health benefits of edible insects while not having to look the insect in the face before biting down. Who can say no to chocolate chip cookies that pack a protein punch? 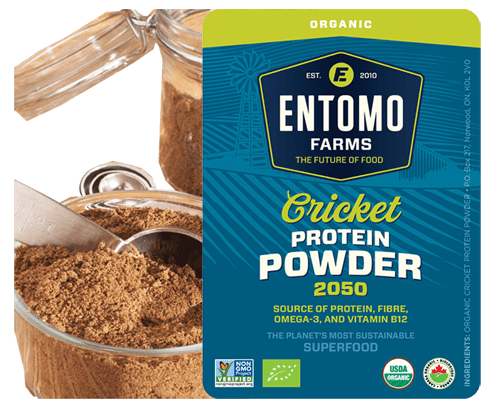 Make your own cricket flour using EntomoFarms plain or organic cricket powder. Cricket powder has a shelf life of around a year so you can make a big batch and keep what’s left for future use. For many, the reason to use cricket flour is because of the animal protein that includes all 9 essential amino acids. Crickets have as much protein as beef or salmon. Prebiotics is another reason. Gut health is receiving more attention lately and probiotics have become a big nutritional supplement. Cricket powder is packed with prebiotics which are nutrients for probiotics. Therefore, cricket flour helps support strong gut health. If Omega 3, Iron, Calcium and B12 are important to you, here is another reason. 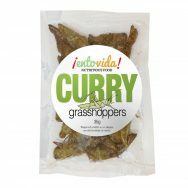 Not only are many vitamins and minerals available from insects, they are very digestible as well. If you’re on the Paleo Diet, you can’t get more paleo than this. But, there are also environmental and social issues. Many current agriculture methods are not sustainable and are a major cause of pollution and therefore, global warming. Insects can be grown using less water and land than conventional livestock. Way less. They can be grown inside or out and they can be farmed vertically by industry or the family farm. This is important. The availability of edible insects is universal, it’s worldwide. Edible insects can be grown at home by just about anyone. The mission of Entosense, Inc. is to bring edible insects in to the diets of North Americans for their own benefit and that of the world. If edible insects becomes a trend here, it will help spread throughout the world. It’s true that much of the world already eat insects but it is losing popularity instead of gaining. Meat, especially beef, is gaining popularity at a time when we need to reduce meat consumption, not increase it. Edible insects are one sustainable answer. And, a damn good one. Insects offer a wide variety of new flavors and textures for adventurous chefs and home cooks. There are more insects than any other animal group. Their tastes and texture vary widely. Embrace this new culinary experience. It will be good for you and good for the planet.